The fleet investigates a derelict alien ship; guards on the prison barge begin a revolt with the intention of executing Baltar. The variant cover of this issue has the first "T" in the Battlestar Galactica logo slightly off-kilter. 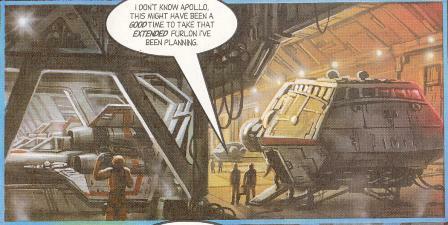 On page 4, panel 2, Commander Adama has some items on a shelf in his bedroom that frankly look like record albums! Colonel Tigh uses the term "cycles" to describe the distance from the fleet of unidentified ships that have been detected. Presumably a cycle is a distance unit of measurement. On page 5, Omega is depicted wearing the beige uniform of a warrior, but it must just be a coloring mistake because he is back to wearing command blue for the rest of the issue. Also on page 5, Omega informs Adama and Tigh that, while most of the ships in the alien fleet are about the size of freighters, one of them is twenty times the size of the Galactica and Tigh remarks, "That's the size of a small moon!" Possibly this line is a reference by writer Kuhoric to Luke Skywalker's line in Star Wars: A New Hope in reference to the Death Star when he at first thinks the space station is a small moon. On page 10, Dr. Wilker uses the term "light yahrens", of course, instead of "light years". The narrative on page 12 reveals that Baltar has listened and watched for days as the guards on the prison barge conspired to end his life. This tells the reader that this issue takes place not long after "The Law of Volahd" Part 2, in which Baltar is first confronted by one of the guards about the injustice of Adama bargaining to let Baltar go free on an uninhabited planet. 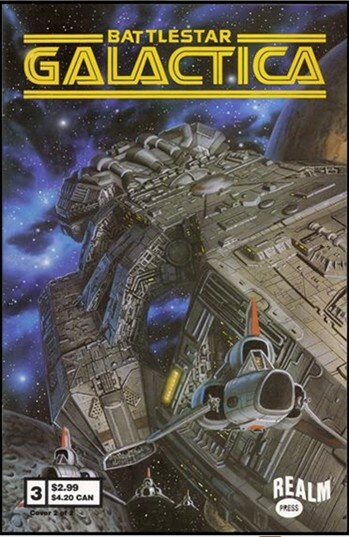 On page 13, Imperious Leader implies that there is, or will be, a Vulpa Seven who will proceed to give chase to the humans if Vulpa Six fails to crush the human fleet with a force of four basestars. The space suits worn by the Colonial boarding team to the alien derelict appear quite a bit different than ones seen worn by Apollo and Starbuck in "Fire in Space".